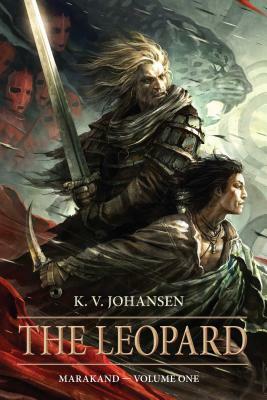 Ahjvar, the assassin known as the Leopard, wants only to die, to end the curse that binds him to a life of horror. Although he has no reason to trust the goddess Catairanach or her messenger Deyandara, fugitive heir to a murdered tribal queen, desperation leads him to accept her bargain: if he kills the mad prophet known as the Voice of Marakand, Catairanach will free him of his curse. Accompanying him on his mission is the one person he has let close to him in a lifetime of death, a runaway slave named Ghu. Ahj knows Ghu is far from the half-wit others think him, but in Marakand, the great city where the caravan roads of east and west meet, both will need to face the deepest secrets of their souls, if either is to survive the undying enemies who hunt them and find a way through the darkness that damns the Leopard. To Marakand, too, come a Northron wanderer and her demon verrbjarn lover, carrying the obsidian sword Lakkariss, a weapon forged by the Old Great Gods to bring their justice to the seven devils who escaped the cold hells so long before. K. V. Johansen is the author of Blackdog and numerous works for children, teens, and adults. She predominantly writes secondary-world fantasy but is also the author of some science fiction and literary criticism, and of a collection retelling medieval Danish ballads. With an artist friend, she is working on a manga-style adaptation of a short story set in the Blackdog world. Johansen has an MA from the Centre for Medieval Studies at the University of Toronto. Her lifelong interest in ancient and medieval history and the history of languages has had a great influence on her writing and world building. Occasionally, she masquerades as an editor, freelance journalist, or book reviewer, and dabbles (infrequently) in illustration.